A research study finds that white working-class Americans are not as homogenous as they are portrayed. 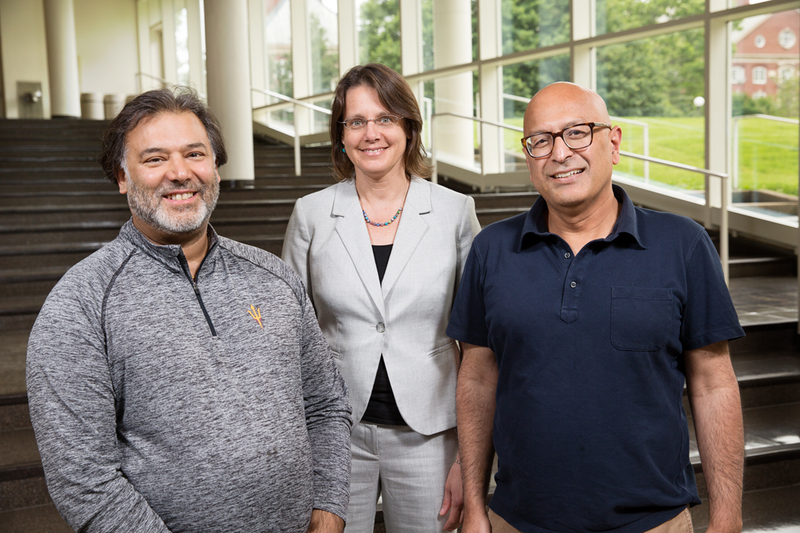 University of Illinois urban and regional planning professor Stacy Harwood, center, worked with Coventry University professor Harris Beider, right, and researcher Kusminder Chahal, left, to look at the views of white working-class communities on identity, immigration, race and change. CHAMPAIGN, Ill. — A new research study presents a perspective on the social and political views of white working-class communities. “I saw how problematic that overly simplistic narrative is for building coalitions,” said University of Illinois urban and regional planning professor Stacy Harwood. She is one of the researchers who conducted the study, along with Harris Beider, a Coventry University professor and a visiting professor in Columbia University’s School of International and Public Affairs, and Kusminder Chahal, a research associate for the Centre for Trust, Peace and Social Relations at Coventry University, which published the report. The project was funded by the Open Society Foundations US Programs. The researchers found that working-class Americans are far more diverse than they’ve been described, but they share a struggle with economic and cultural insecurity. They embrace the concept of racial diversity, but make few efforts to bridge the divide between racial and ethnic groups. Between August 2016 and March 2017, the researchers visited five cities: New York City; Birmingham, Alabama; Dayton, Ohio; Tacoma, Washington; and Phoenix. They asked more than 400 people who identified themselves as white working class for their views on identity, immigration and race, as well as change. “Working class” was not defined by the people interviewed in terms of education or income level or type of occupation as much as it was by common values – work ethic, providing for family, helping others in need, being honest and direct, not depending on welfare. Among those identifying themselves as working class were college graduates and those in professional jobs, as well as workers making minimum wage. “There’s an assumption that they are a homogenous group, but there’s depth and diversity that’s not given credit,” Beider said. The interviews took place during the presidential election cycle. White working-class voters were seen as crucial to the election of President Trump, but the people who spoke with the researchers were not Trump supporters across the board. Many were genuinely conflicted about the presidential candidates. A common view was that Trump was an outsider who was sympathetic to their economic struggles and who would protect working-class jobs. Many saw him as a “straight talker,” reflecting their anti-establishment rage. “For us doing work on the ground, we were not surprised by the outcome of the election,” Beider said. The people interviewed placed a strong emphasis on fairness, equal treatment and “playing by the rules.” Among their concerns were undocumented immigrants and communities of color receiving preferential treatment for jobs, services or benefits, while white working-class residents are left behind. “There was no sense their lives were represented,” Chahal said. Finally, the report concluded that members of white working-class communities are racially diverse within their families, neighborhoods and workplaces. They see that diversity as evidence of lack of racism or lack of segregation in their communities. But they also often use colorblind language that denies the existence of institutional racism or racial differences, the report stated. White working-class communities and working-class communities of color come together daily for activities, entertainment and community events. But the report found there are few examples of cross-racial coalition building. The researchers plan another phase of the project in which they will go back to the same communities and look at how to support cross-racial coalition building in a hostile political environment. Editor’s notes: To reach Stacy Harwood, email sharwood@illinois.edu. The report, “The other America: White working-class views on belonging, change, identity, and immigration,” is available online.